The offshore pipeline and riser construction and installation technology described here is very different from the common offshore technologies used at present. 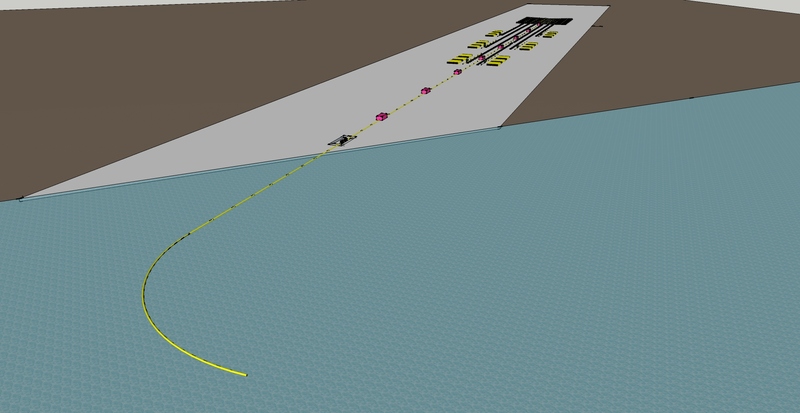 By using the O-lay technology operational production costs can be reduced compared to the existing general methods of pipe laying offshore. With O-lay, the pipe laying operations will be faster than other methods used today. Pipe line installation of larger diameter pipe can be as fast as 25 km per day. Furthermore the technology is safer because there are less people working in the offshore environment and the offshore operations are done in a shorter period of time. The bottleneck of welding and testing on the traditional lay-barge is not a procedure that is part of the installation process anymore. Welding and testing are done on an onshore construction site. The main difference between the new, state of the art, patented O-lay system and the existing systems is that the total length of the pipe is welded, post weld treated and tested onshore on a site that is near the waterfront. Depending on the local situation, series of "long pipes", with a length of 50 to 1500 meter, are produced and temporarily stored in the pipe yard till they are transported into the water. (Example: A pipe with OD 20 inch (500mm) will form a spiral of 250 meter diameter). The O-lay technology has the great advantage that welding can be performed under optimal conditions. With traditional S-lay the pipeline is lowered in the water just after the welds are finished. This cools down the welds and the HAZ relatively fast and induces local area's with high tensile stresses. Due to cyclic stresses these local area high tensile stresses can initiate cracks in the material. With O-lay there is ample time to cool the welds slowly and to apply post weld treatments like ultrasonic impact treatment (UIT), needle peening and weld toe dressing to improve the weld geometry. These applications increase the resistance against crack initiation when a cyclic load is applied. The spiraled pipe can form a total length of more than 100 km pipeline. When the pipe spiral has reached its predetermined length, the whole spiral can be transported (with the help of tugboats as is shown in the photo below) to the place where the installation has to be done. When the spiral has arrived at the location where the pipe will be installed, the spiral shall be unwound and with the help of a special prepared vessel be lowered to the seabed. This method of pipe line installation is especially interesting for water depths where the S-lay method is being used and also in very shallow waters. In the picture a tug boat pulls the floating spiral. Instead of installing pipe with the combination of S-lay and a spiralled pipe it is also possible to retrieve pipe from the sea bottom. Thereafter the pipe can then be transformed into a large spiral after inspection. In this way it is possible re-use the pipe again on a different location. This will reduce the costs even further and could be very interesting to use on very small oil or gas fields. Several tests in laboratory and under real conditions (as seen in photo above) have shown that the method described is feasible for pipelines of all diameters.